So you may have noticed that before yesterday I hadn't blogged in ages. The main reason for that is that over the summer I decided to keep a journal to record all the fun we had in the school holidays. And by that I mean a proper paper scrapbook filled with pictures and words and even a few drawings all about our adventures. I loved doing it and I still flick through it every day as it makes me smile. Anyway, all this scrapbooking of an evening left little time for blogging. Instead of feeling guilty about not doing it I decided to consciously take a break for August and come back to this little old blog of mine in September. So here I am. Hello! I hope you had a fabulous summer. Here is one of my favourite photos of the summer. 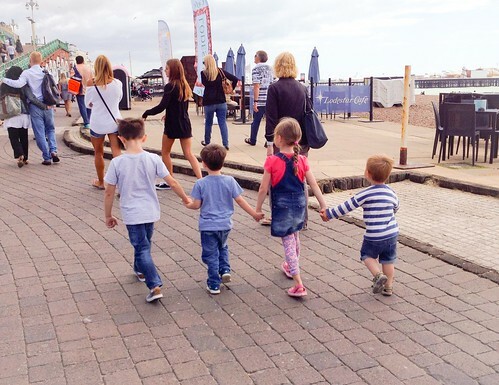 It's my son and daughter and their friends walking along holiday hands on Brighton seafront. It kind of sums up the summer for us as we spent most of the time out and about with friends. I hope all had a wonderful summer. Here's to a brilliant autumn! I really enjoyed doing the scrapbook. I am proud of myself for managing an entry for every single day of the holiday. I should have said this the post above that it was all your fault. You inspired me with your journal and subsequently looking at all the other lovely entries on that hashtag.